The wonderful thing about the internet is that it enables us to meet new people from all over the world. 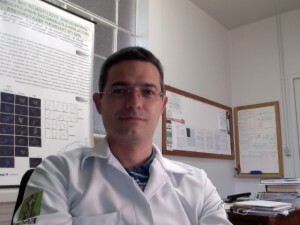 I met Mateus Mondin, a plant scientist from the University of São Paulo in Brazil, through the Annals of Botany Blog. Since then we have stayed in contact through a variety of social networking sites. You find more information about Mateus’ lab and research on his website and on Facebook. Thank you, Mateus, for completing my questionnaire! 1) What is your research about? My research is on chromosome structure and function. For many years it was called cytogenetics, but nowadays the name has been changed so much that I don’t know how I should call it (laugh! ), chromosome biology, cytogenomics, anything else. We focus on how chromosomes works during the cell cycle, mitosis and meiosis division, as well as studying their number, morphology, comparing different species – comparative genomics. This information is important for plant breeding which produces our food. As I am in a tropical region with tremendous biodiversity, we need to help other researchers to characterize the karyotype (chromosome number and morphology) of different species. I have been working with sugarcane, alfalfa, maize (corn), cotton, eucalyptus, crotalaria and several other species. Most of our research is based on microscopy, using two main strategies: fluorescent in situ hybridization (FISH) and immunocytochemistry. In the former, we use a DNA fragment which can be a gene or a repetitive sequence. It is hybridized onto chromosomes or the nucleus and so gives us a precise localization of this sequence. In immunocytochemistry we use antibodies that bind to specific proteins of the chromosomes or nucleus, in our case. Both techniques help us with the task of integrating the heritable information which is divided in genetic and in epigenetic information. Moreover, much effort is needed in molecular approaches and bioinformatics to support the information detected at the cellular level. This kind of study will be very important in the following years, since the climate has changed a lot and we don’t know what be the impact on our biodiversity and crop production will be. So I believe that our work can provide some evidence in the way of how we can protect our plants, understanding how their cells work. 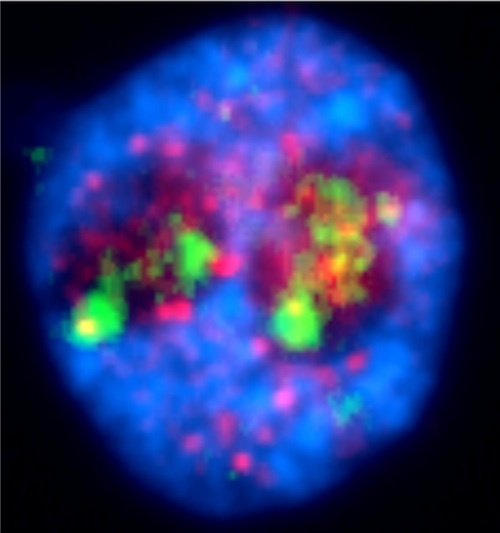 The photo shows a nucleus (DAPI stained) with two visible nucleoli, showing in red a histone modification [epigenetic information] and in green the 45S rDNA (genes of rRNA 18S-5.8S-26S) [genetic information]. The yellow colour represents interaction between both. Species: Crotalaria retusa – Family: Leguminosae-Papilionoideae. 2) What is the best and the worst thing about your work? I love my work! Every day there are a lot of challenges and different things happening. Moreover I can be creative and imaginative as much as I wish. That’s great! But, being specific, I guess the best part is when I am using the microscope seeing all those different fluorescent colors; each one with a specific meaning. Or, when somebody found a very beautiful metaphase and you can listen the scream echoing through the laboratory: ‘Wow, come on everybody, I found the most beautiful metaphase of my life!’ Most of the time it is not true because the next day he/she will find another ‘most beautiful’; but it’s really funny. The worst part is when I am not being a scientist, mainly working with administrative and bureaucratic things. It’s needed but I don’t like! 3) How did you become a plant scientist? Being serious, I loved plants since I was very young and grew up very close to the fields in my country. My family has a long tradition of laboring on the fields. My dad and mom labored hard on coffee, cotton, wheat and other fields when they were young. Later they moved to the city where they studied until university [a tremendous opportunity in that time! ]; one of my uncles is an agronomist specialized in Horticultural Science and my cousins are farmers. Then, I think they influenced me in my very early decision to work with plants. I decided to be an agronomist before I was 9 years old. 4) What do you do to get your mind off work? I am a sportsman. I love sports. If I was not a scientist, certainly I would be working with sports in some way. You know, I’m in Brazil, so there is only one sport here, football; everything is football, and practically no other sport is important. Then, I used to play football when I was younger and during my graduation and post-graduation. Later I moved to mountain biking. Mountain biking gives me adrenaline and I have been practicing three times a week when my agenda allows. Recently, after a year living in England, I have been learning golf. Golf gives me concentration and switches off my mind completely from work. I can’t explain how good the practicing of golf has been to my professional life and how deep it turns off my mind. However it is a big challenge to play golf in Brazil and you can’t imagine how much! 5) What advice would you give to students? Well, I can talk about my own experience. Since I decided to be an agronomist very young, during my teenage years I had some problems. Most of my school friends criticized my decision. At least in Brazil you are more recognized if you are a lawyer, medical doctor, an engineer, but not if you are an agronomist or a botanist. People don’t understand the importance of our profession. They forget that our survival is completely dependent of the plants, from their food to their clothes and even the air that they breathe. However, I never gave up on my dream! But some dreams take a long way to be realized. After many years if someone asked me if I would like be in another career, I would say no! I’m very happy to know that my career as a plant scientist is the unique hope to the humankind, even if they don’t recognize this. I know Mateus since 2001 and Hi is a dedicated professional. I am só happy to to know litlle more about him. After going through this questionnaire replies anyone having a little interest in plant sciences can think of a carrier in it. It inspired me a lot. The exhaustive replies also make one to think about the dedication of a great scientist.